Click here to send in your votes! Seattle Bride Magazine has opened the voting for the 2012 Best of Bride Awards! This award honors the best and brightest of Seattle wedding vendors in all facets of our industry. 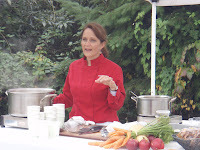 We encourage you visit the Seattle Bride website and vote for Lisa Dupar Catering and your other favorite wedding vendors. Thank you for another wonderful year; we truly get to work with some of the greatest vendors and clients in the Pacific Northwest! Lisa recently visited the Issaquah Farmers Market on it’s last day of the season to share her delicious carrot apple soup. This makes for a hearty, healthy, and filling dinner in the Fall during apple season. Garnish with apple chips for a lovely sweet crunch. Enjoy! We tapped our operations manager Andrew and staffing coordinator Carlee to share what their favorite Seattle bars were – check out their favs below! Keep checking back for more staff favorites and ideas…we will be featuring more in the coming months! One of my favorite places to go is Six Arms in Seattle off Capitol Hill. First time I was ever there was after seeinga one-man-show called I Might Be EdgarAllen Poe. We were sitting in the loft eating a mess of hand-cut fries and enjoying one of the house-madebrews (an absolutely amazing combination) and I looked over to notice a very large stuffed raven(“Nevermore!”) sitting on a chandelier at eye level looking at me… Over the next few years, the number of birdsincreased steadily and slowly. I was hooked! The fries, the beers, thelife-sized Shiva, the loft and the food are all great! I love to do happy hour with friends at the Matador in Redmond or Ballard. Theyhave great happy hour specials and the food and drinks are great! I love that it’s not your run-of-the-mill bar and their tequila selection is unlike anyother I have seen. 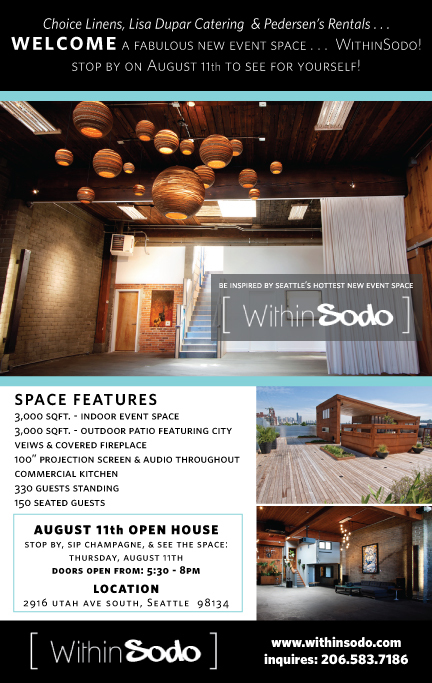 We have the pleasure of welcoming a brand new (and very gorgeous) events venue – WithinSodo – at their August 11th open house! Enjoy champagne & hors d’oeuvres provided by Lisa Dupar Catering while taking in the view from the deck; this new space caters to any event you can imagine and we’re sure you’ll be planning something of your own by the end of the evening! Oh my Gosh does Tom Douglas and his team know how to have fun! 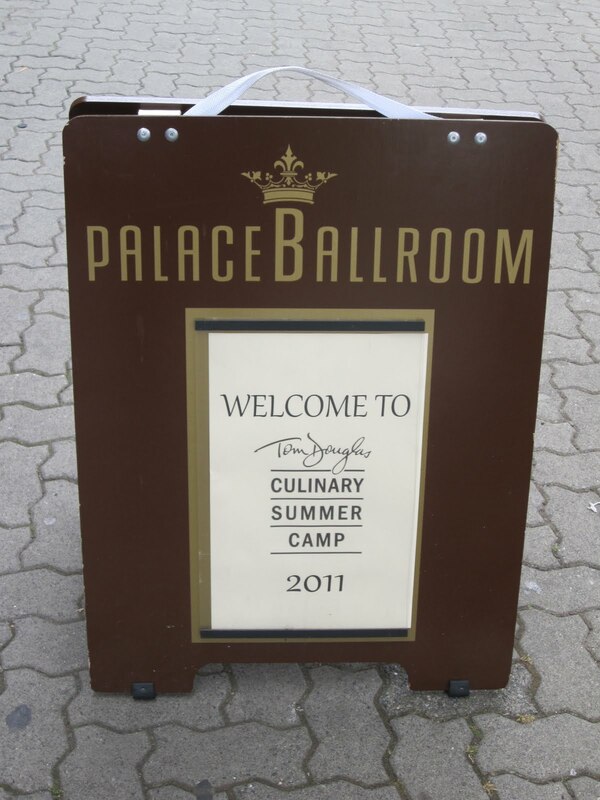 Showing up early for my demo of recipes from Fried Chicken and Champagne at Tom’s summer camp was a fun surprise. 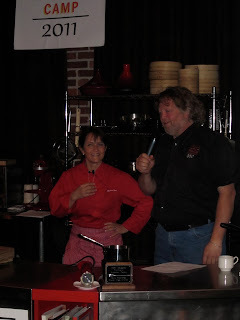 Morning breakfast of Eggs & Bacon with Manhattans was being cleared away and Prosecco was being popped for Chef Brock Johnson’s (of Dalia Lounge) demo of amazing pates and rillettes. 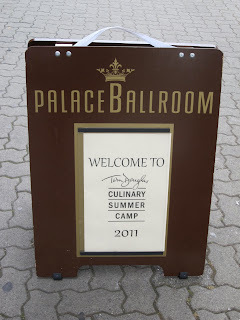 On the 4th day of the campers Food and Beverage Marathon, I was certain the campers would be dozing off before “lunch”. No heads hitting the desk in this classroom! 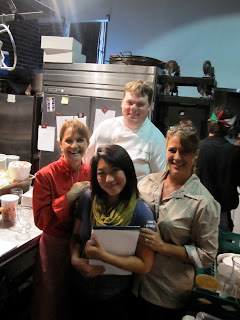 These campers were serious about their food & libation tasting. Maker’s Mark was the choice for the Peach Julep starting the sampling of Southern dishes prepared by Tom’s team that were perfectly executed. 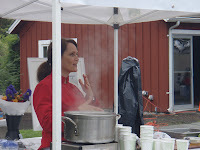 Campers commented most on the Watermelon Chutney with the corn fritters and the Frogmore Stew as their favorites, though the Fried Peach Pie plates were cleaned also. Both recipes from the cookbook! After the southern mid-morning bites, they headed across the street for lunch at Palace Kitchen with Josh Henderson from Skillet (one of my new favorite spots). Tom’s reputation for generosity spills over into everything he does and this camp experience was no different. I just wanted to take the rest of the week off and join the campers in their Fabulous Food Week. Rumor has it, next year’s class is already sold out! !